Radio Edit 2:48 Freaks 541 / N.E.W.S. Extended Mix 4:24 Freaks 541 / N.E.W.S. 4:23 Serious Beats 80 541 / N.E.W.S. 2:48 MNM Party 2015.1 541 / N.E.W.S. Vato Gonzalez Remix 4:25 Laundry Day 2015 541 / N.E.W.S. 2:48 MNM Party 2017 * Volume 1 541 / N.E.W.S. I had some hostility to this at first but as much as I resist admitting it, this is kinda great. I love how what was originally just another Melbourne Bounce instrumental had vocals added on top of it and surprisingly become one of the biggest hits of 2014, while also reaching memetic status. It still blows my mind how big this song was, it's something so unpredictable it genuinely fascinates me.<br><br>I actually prefer this version now. Savage is far from the best rapper but he's actually enjoyable in a guilty pleasure way. The instrumental is solid though could be better, but is essentially the backbone of the song for me. Lyrically and vocally it may be absolutely mindless but it's in a fun way that makes this so enjoyable to listen to. It still bugs me that it needed another version created to achieve all this success, but with such a legendary and hilarious chart run I can let it slide. Perhaps the most surprising chart event for me in 2014 was Savage getting not one, but two top 3 hits. My favourite of the three top 5 crossover Melbourne Bounce hits of 2014 (those being this, "Swing" and "Ah Yeah So What"). Solid track. Savage ain't too bad either. Joel Fletcher has a lot to answer for; Savage should have stayed in 2006 where he belonged. Admittedly he's not so bad here, but I could most certainly do without another one of these things charting. Some cool sounds on this. 3.5 - 4. I prefer the solo version better, but this isn't too bad. I've managed to avoid this up to now and hello it's #1 in New Zealand? What the hell!! Not a fan. 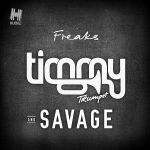 Timmy Trumpet looks like a Jersey Shore character and Savage is awful as always and offers nothing fresh or enjoyable.<br><br>EDIT: Ok so it's kinda catchy and it's a good running song. 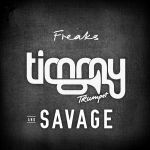 ▒ Vocale cover uit de nazomer van 2014 van de grappige, swingende zaterdagavonddansplaat uit ½ maart 2014 van de Australische house muzikant, producer en DJ uit Sydney: "Tim Smith", alias: "Timmy Trumpet" !!! Met ondersteuning van de Nieuw-Zeelandse rapper: "Savage" !!! Ook deze versie: 4 sterren ☺!!! Solid piece of work. This will probably be played at everybody's new years' party. Us Kiwis are proud of you, Savage, and we'll definitely keep listening to Timmy's music, too. In tegenstelling tot bovenstaande reviewers, die toch liever de soloversie horen, prefereer ik toch de vocale versie, vooral omdat de vocalen van rapper Savage het nummer toch wat meer dynamiek geven. Ik snap best dat sommigen Savage juist irritant vinden, maar ik vind hem juist een toevoeging. Lekker nummer. En weer een nummer dat mag oprotten. Het is officieel, ik ga voorlopig geen ''onbekende'' hitlijstentroep beluisteren. Passt hervorragend in die Fasnachtszeit. Brachialer Sound ist das hier durchaus, nur beim Spaß sehe ich durchaus noch Defizite. Strengt schon beim ersten Hören extrem an. Keine Melodie, gefällt mir gar nicht. Auf der Partymeile sicher der Kracher, aber sonst nicht viel wert. Nun, dass ich den damals irgendwie verpasst hatte, ist verständlich, wenn man seine Chartsgeschichte hier betrachtet... Ist mir auch zu wenig melodiös, kraftvoll, aber nicht mehr. Gute 3. Fürs Workout vermutlich nicht verkehrt. An Grausamkeit nur schwer zu überbieten.